"The PLA has been a politicized ‘party army' since its inception and exists to guarantee the CCP regime's survival above all else," the DIA report on "China's Military Power" says. DIA Director Army Lt. Gen. Robert Ashley stated in a preface to the report that it is important to understand the Chinese military. "China is building a robust, lethal force with capabilities spanning the air, maritime, space, and information domains which will enable China to impose its will in the region," he said. "As it continues to grow in strength and confidence, our nation's leaders will face a China insistent on having a greater voice in global interactions, which at times may be antithetical to U.S. interests. With a deeper understanding of the military might behind Chinese economic and diplomatic efforts, we can provide our own national political, economic, and military leaders the widest range of options for choosing when to counter, when to encourage, and when to join with China in actions around the world." To maintain tight control, a new PLA Political Work Department was created similar to the General Political Department, which in the past funded influence operations involving gatherings that sought to co-opt former American generals and admirals into supporting Chinese security policies. "The PLA's political work system is the primary means through which the CCP ‘controls the gun' in accordance with Mao Zedong's famous dictum that ‘political power grows out of the barrel of a gun,'" the report said. Almost all PLA officers are members of the Communist Party and PLA officers in recent years have made up about 20 percent of the Party's Central Committee, the 205-member body that is one of the senior organs of power. The Central Military Commission, headed by Xi, includes two PLA generals and is the Party unit that controls the military. In 1989, Chinese leaders called in PLA military units from outside the capital during the military operation to break up pro-democracy protests in Beijing's Tiananmen Square. Thousands were killed and the crackdown led to even greater repression that remains in place. In China, anti-Communist Party sentiment is growing as a result of increasingly repressive policies put in place designed to stifle all dissent and free expression. The DIA report identifies tiers of interlocking systems used by the Party to penetrate all levels of the military, including commissars, party committees and party discipline inspections. China is engaging in a kind of warfare that is below the threshold of military conflict as part of its drive for global supremacy. Militarily, the DIA said China is rapidly building a modern army with advanced forces in a shift from the Mao era when the military was based on masses of troops. "Today's PLA is still far from being able to deploy large numbers of conventional forces globally, but China has developed nuclear, space, cyberspace, and other capabilities that can reach potential adversaries across the globe," the report said. The Chinese also are building up nuclear forces that Beijing claims will not be the first used in a conflict, only in retaliation. The DIA questioned the so-called no-first-use doctrine noting Chinese statements about using nuclear arms in response to precision-guided conventional attacks. Chinese missiles are the weapon of choice for the PLA and include new and modern systems of varying ranges and multiple warheads. 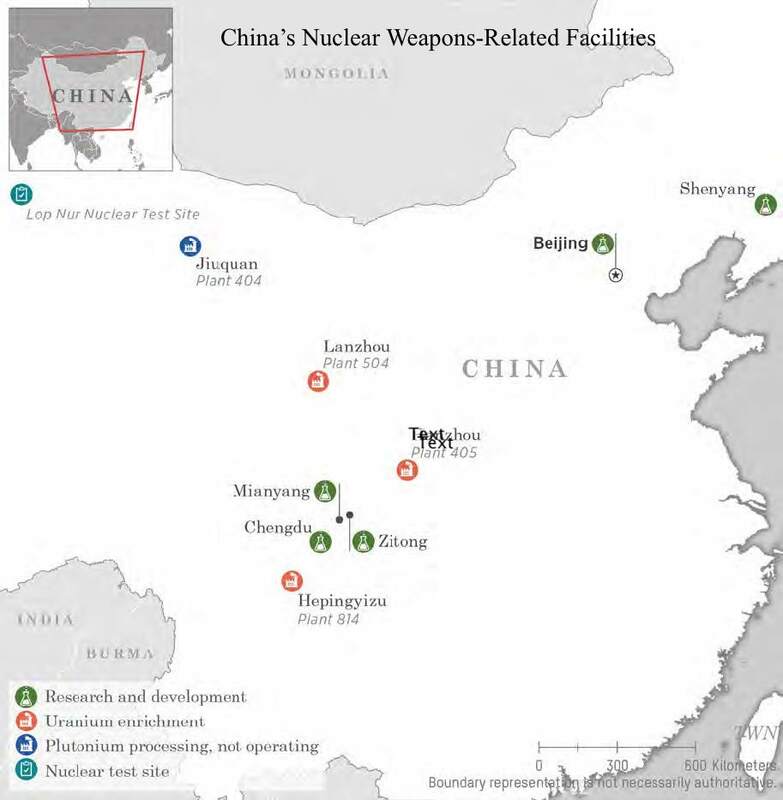 The report provides the first official disclosure of the location of Chinese nuclear facilities spread out throughout the country. The facilities are main targets for U.S. nuclear strikes as well as cyber attacks. "China maintains a stockpile of nuclear warheads and continues research on and development and production of new nuclear weapons," the report said. By contrast, the United States is not developing new nuclear arms and is behind schedule in upgrading existing weapons. "The overall grim tone of this document is refreshing—there’s less concern about hurting China’s feelings," said Michael Pillsbury, a former senior Pentagon official who has written extensively on China. "The new generation is obviously taking the reins away from the older panda huggers who used to be in charge of China at DIA." The Chinese are building space weapons, including ground-based jammers, lasers, and anti-satellite missiles, and has kept most information about the weapons secret, the report said. "China is employing more sophisticated satellite operations and probably is testing on-orbit dual-use technologies that could be applied to counterspace missions," the report said. The PLA is also building up cyber attack capabilities that can be used for spying and destructive attacks. "In the coming years, the PLA is likely to grow even more technologically advanced, with equipment comparable to that of other modern militaries," the report said. "The PLA will acquire advanced fighter aircraft, naval vessels, missile systems, and space and cyberspace assets as it organizes and trains to address 21st century threats farther from China's shores." The report for the first time identified the PLA military intelligence service, known as 2PLA, as now part of the Joint Staff Department of the Central Military Commission. By contrast, the cyber and signals intelligence unit and electronic warfare unit, known as 3PLA and 4PLA, were folded into a new Strategic Support Force that conducts cyber, space, and electronic warfare. Separately, the Pentagon released a second report on China's global expansion that was required under recent congressional legislation. That report, for the first time in years, recognizes that China's military buildup and other means of power projection are aimed at global expansion to secure Beijing's continuation of Communist Party rule. For many years, U.S. intelligence analysts argued China harbored global ambitions, and not only sought to achieve regional hegemony. "China specifically seeks to displace the United States in the Indo-Pacific region, expand the reaches of its state-driven economic model, and reorder the region in its favor as the preeminent power," the report said. Additionally, the Pentagon's recent National Defense Strategy states: "China wants to shape a world consistent with its authoritarian model—gaining veto authority over other nations’ economic, diplomatic, and security decisions," the report said. Militarily, Beijing's ambitions also are global. "China's military emphasis has also shifted outward," the report said. The PLA Navy, for example, has changed from seeking to control offshore waters to "open seas protection," reflecting plans to expand globally. "China's military strategy and ongoing PLA reforms reflect the abandonment of its historically land-centric mentality," the report said. 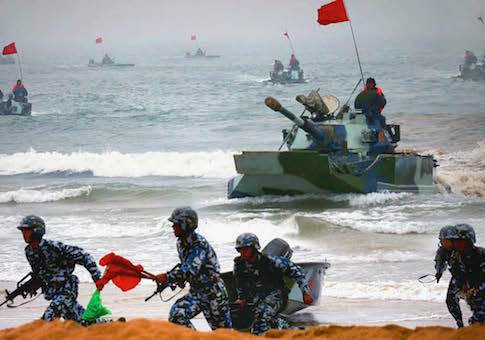 "Similarly, doctrinal references to ‘forward edge defense' that would move potential conflicts far from China's territory suggest PLA strategists envision an increasingly global role, which they are actively implementing." China has a military base on the Horn of Africa at Djibouti and is seeking other bases around the world as part of the expansion. The report makes no mention of China's deployment of advanced missiles in the South China Sea in violation of a pledge from Chinese leader Xi not to militarize the South China Sea. The report also fails to mention China's interference in the U.S. electoral process, a threat disclosed in speeches earlier this year by President Trump and Vice President Mike Pence. "While there may be some gaps in the scope of this report, the value is in the fact that the DoD is acknowledging the PRC's global aspirations," said retired Navy Capt. Jim Fanell, a former intelligence chief for the Navy's Pacific Fleet. Fanell said for over the past 20 years so-called China experts insisted the Chinese had no strategic objectives beyond modernizing Mao-era equipment and later asserted the buildup was limited to creating a buffer from Chinese coasts and were limited to being a regional power. "Now we have clear and unambiguous evidence of the PRC's plan for global hegemony," Fanell said. "In each case the PRC has far surpassed our expectations. As such, we should be taking a whole-of-government approach to defend against this challenge to our own national security interests and those of the rest of the international community." Rick Fisher, a China expert, also said the report failed to identify Chinese military efforts to build alliances and political networks, such as the anti-U.S. Shanghai Cooperation Organization. Also, the report failed to mention China's drive to ultimately subdue democratic Taiwan, which Beijing views as a breakaway province. "If China were to conquer Taiwan, it would turn the island into a vast base for nuclear and non-nuclear power projection, hosting nuclear ballistic missile submarines, strategic bombers, nuclear missiles in addition to marine and airborne forces," he said. Fisher noted however that groupthink among China analysts would have made the report on Chinese expansion impossible year ago. "Let's be frank, about 15 years ago if you brought up the subject of ‘future power projection' at an unclassified PLA studies conference, there would be audible snickering around the room," he said. "This report is a clear sign that more in Washington are coming to realize that hubris in our assessment of China's strategic ambitions abets disarmament and then defeat."